Click on the links to watch video demonstrations of the actions for the rhymes. A delightful collection of the best loved animal, finger, action and counting rhymes that little children love hearing - and doing the actions to - again and again. Rhymes include: ‘The Wheels on the Bus’, ‘Incy Wincy Spider’, ‘Two Little Dicky Birds’, ‘Here we go Round the Mulberry Bush’, ‘Head, Shoulders, Knees and Toes’, and ‘Row, Row, Row your Boat’. Tabbed board pages enable young children to find their favourite rhymes quickly and easily. See the actions and songs demonstrated on the Usborne Quicklinks Website. Sharing poetry with your children is a wonderful way to explore and share language and little ones respond well to the rhythms. The illustrations by Giuliana Gregori are unusual and delicate, packed with fascinating and entertaining detail which really extends the understanding of the poem. 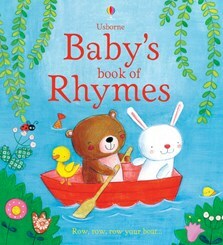 Get even more pleasure from this book at www.usborne-quicklinks.com - when you type in baby rhymes, you will hear the tunes and see the actions.